http://www.sports-reference.com/olympics/ lists ever Olympic gold medal winner that has ever lived so you might be surprised to know that this post concerns Olympic champions that have never graced the pages of that website. These are the champions who have only existed within the covers of a book, the frames of a cartoon or whilst projected on the silver screen or into your homes via television. For decades writers have used the Olympic Games as a backdrop to stories of sporting triumph or, in some cases, used a supposed Olympic background to emphasize the heroic and villainous traits of a character. Let’s start with the movies. I have deliberated avoided films which are based on real Olympic history, even those whose grasp on history is at best fairly tenuous. If you consider the headlines of the last few weeks it’s with a certain sense of irony we begin with the character of Ivan Drago from the 4th instalment of the Rocky series of movies. The chemically assisted Soviet boxer, probably designed as a champion from the Moscow Olympics, may be a caricature of Communist era Russia but has remained a popular villain in the thirty years since the film was released. The script also makes it clear that Drago’s wife, Ludmilla, is herself an Olympic champion in the swimming pool. 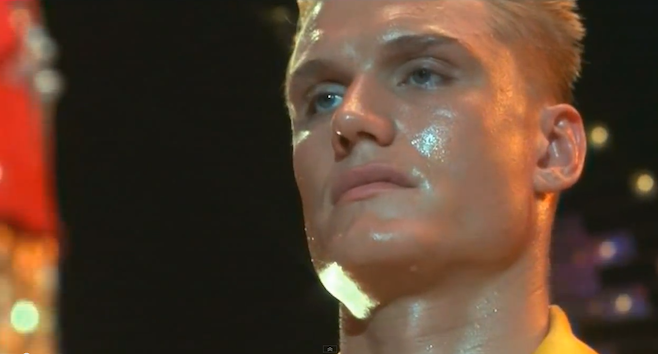 Incidentally the actor, who played Drago, Dolph Lundgren, had a genuine Olympic link – he was the section manager for the US modern pentathlon team in Atlanta in 1996. The Rocky series may be nearly forty years old now but that’s nothing compared to the longevity of James Bond. In the 2002 film “Die Another Day” we are introduced to MI6 agent Miranda Frost, an Olympic champion from the Sydney Olympics, who is eventually revealed to be in the debt of the North Korean villain of the piece after he arranged that her opponent for gold “overdosed on steroids”. An earlier film in the series, “For Your Eyes Only”, featured an East German Olympic biathlete turned assassin. Shooting seems a popular Olympic sport in cinematic terms with the Oscar nominated 2014 film “American Sniper” featuring, as a main antagonist, a Syrian Olympic champion marksman called Mustafa and, as strange as it seems, another fictional champion shooter threatened to cause a diplomatic incident for a time in 2005. The Bollywood film “Sarkar” features an Olympic medallist from Dubai who is hired as a contract killer. Unfortunately for the filmmakers the UAE’s only Olympic medal at the time had come from Sheikh Ahmed al-Maktoum, a member of Dubai’s ruling family, in trap shooting. An apology was sent to Sheikh Ahmed and the controversial scenes were edited. 1937 saw the release of “Charlie Chan at the Olympics”, which blended real footage from the Berlin Games into a murder mystery. After the eponymous hero solves the crime he finds time to watch his son win an Olympic swimming title. Even the ancient Olympic Games has been referenced on celluloid in cartoon form through the shape of “Asterix at the Olympic Games” where the eponymous Gaulish hero wins an Olympic title when every one of his opponents succumb to the temptation of magic potion and is disqualified. The following year film producer and self-confessed Olympic fan Richard F. Zanuck produced “The Games”, a movie based on four runners of vastly differing backgrounds who competed for glory in the marathon at a fictional Rome Olympics. 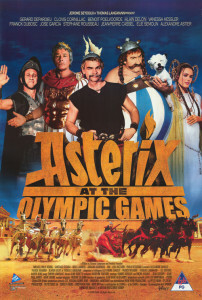 Filmmakers have long seen athletics as a rich seam to mine for Olympic movies as was seen in the 1955 film Geordie, about a Scottish Hammer thrower and Golden Girl from 1979 which centred on the premise of a neo-Nazi scientist adopting an American orphan with the single purpose of turning her into an Olympic pentathlon champion. Other sports that have flourished on the silver screen include figure skating in the guise of romantic comedy “The Cutting Edge”. The story of a spoilt American skater teaming up with a former ice hockey player on and off the ice was successful enough to spawn three sequels. The dubious acting talents of Dolph Lundgren once again feature in “Pentathlon”, probably the only thriller based around the Olympic modern pentathlon. Lundgen plays an East German champion whose comeback for the 1988 Olympic Games is threatened by his former coach turned neo-Nazi terrorist. It was badly received at the time and is generally considered the worst movie on this list. 1997’s “Murder at 1600”, with Diane Lane as a US Secret Service agent who was also an Olympic shooting champion, was another that was panned by the critics. Moving our attention towards television, and also to the distant future, we can point out that 1960s kids TV puppet show Thunderbirds. The show, which was hugely popular in the UK and Australia, featured a character called Gordon Tracy who was / will be an Olympic swimming champion at the butterfly stroke around the year 2060. Much later US animated comedy series “Futurama” introduced the limbo into the 30th century incarnation of the Olympics and set one of the main characters, Jamaican bureaucrat Hermes Conrad, on a quest for the championship against his arch rival Barbados Slim. In literature the classic children’s book “Matilda” by Roald Dahl featured the fearsome Miss Trunchbull who was described as an Olympic javelin, discus and hammer thrower from the 1972 Olympics. It is unknown if she was successful in her efforts in Munich. The introduction of a “throwing the girl by her pigtails” event might have ensured victory. Another favourite of children was the runner Alf Tupper, the “Tough of the Track”, whose appearances in British comics lasted from 1949 to 1992. His longevity as a middle distance runner is marked by his wins at both the Helsinki and Barcelona Olympics. The theatre has not provided much to add to this list with the exception of “Amigos”, a play by the award winning Australian playwright David Williamson. It concerns the relationships inside a medal winning rowing quartet thirty four years after they reach the podium at the 1968 Games. Of course there may be more that we have missed, please feel free to remind us of any omissions. Thanks to David Clark for suggesting this subject. This is a nice post. But technically Die Another Day and For Your Eyes Only are not James Bond movies. The only true James Bond was Sean Connery and to be a James Bond movie, it must feature Sean Connery. Good post otherwise, however. There was “Walk Don’t Run” in 1966 with Cary Grant, Samantha Eggar and Jim Hutton (as the US Olympic race walker at the ’64 Tokyo Olympics. Romantic comedy romp and Hutton’s character was reluctant to reveal his event. Like the Dangerfield of track and field.